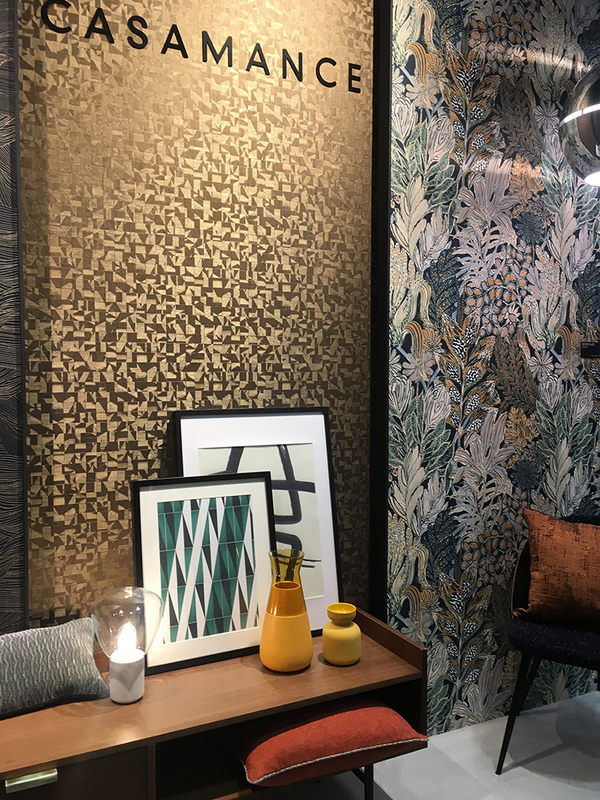 We completed a project soon after our trip to Heimtextil in January and much of the inspiration for pattern and scale came from some of the wallpaper designs that we spotted at the show. 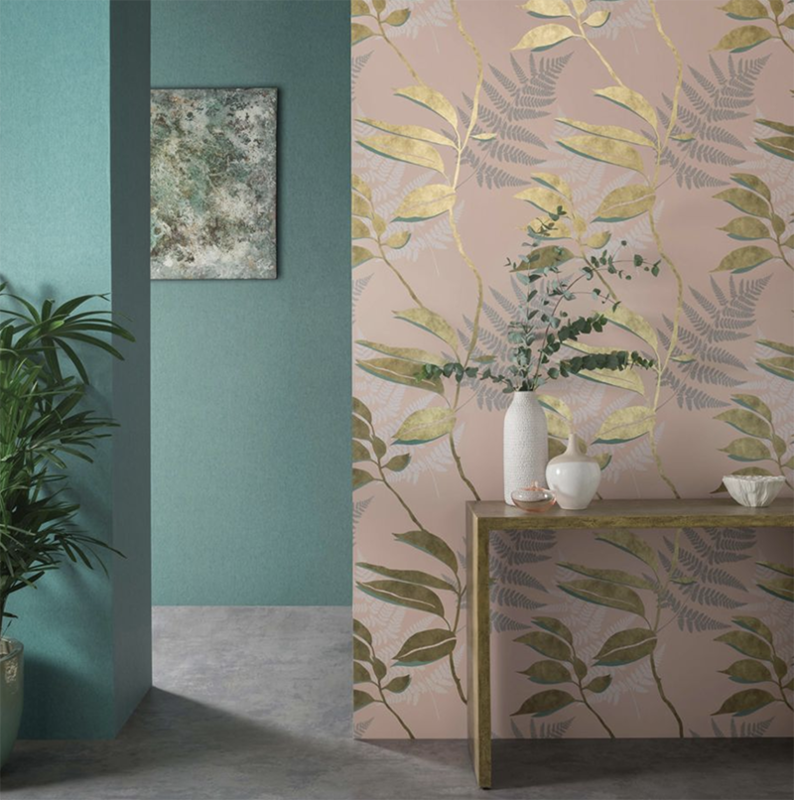 The recent trend away from ‘feature walls’ to increased confidence around how to use colour and pattern in an interior has led to exciting developments for wallpaper and mural designers and producers. 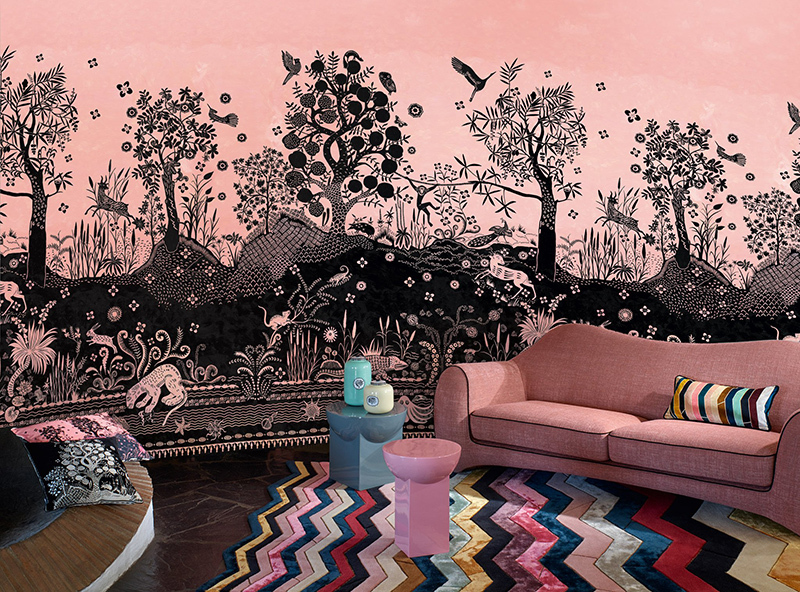 Recently launched designs featuring photorealistic scenes or large scale patterns allow for a much more eye-catching and distinctive look and this style is made even more popular by the interest driven by social media for ‘Instagrammable’ backdrops especially in more public spaces such as shops, bars and restaurants. Of course, from a pattern point of view, there is also so much variety. 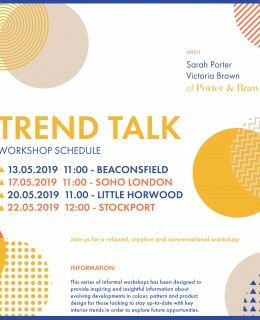 From neutral, calming, textured designs featuring natural references, botanical elements, florals and animals right through to geometric designs with exciting and dynamic colour use. 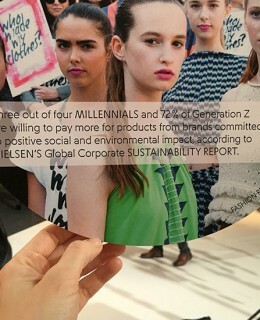 Conversational designs also appeal to the Instagram mindset and those looking to create something really unique; designs featuring architectural details, figures, books and a variety of materials in imitation continue to be prevalent. We’ve picked out a few of the designs out there that have recently caught our eye and inspired a creative direction. 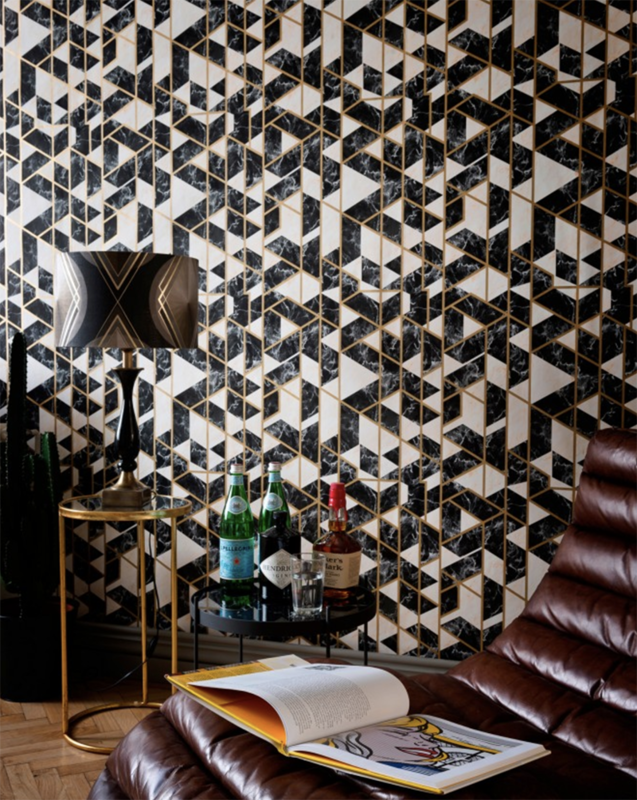 This design from Mind The Gap features a geometric repeat inspired by the popularity of marble as a material in interiors and includes an elegant highlight of metallic. This large scale geometric featuring 0’s inspired curved and angles was designed by Gio Pagani, a graduate in architecture from the Milan Polytechnic, whose goal is to capture emotions and transfer them into his objects and interiors. A simple leaf design, trailing up in fairly large scale, giving just enough detail – not fussy or overbearing. The subtle layering of both forefront shapes and background shadows alongside a brilliant use of metallics and an unusual yet highly appealing palette makes this design, in our opinion one that should stand the test of time extremely well. 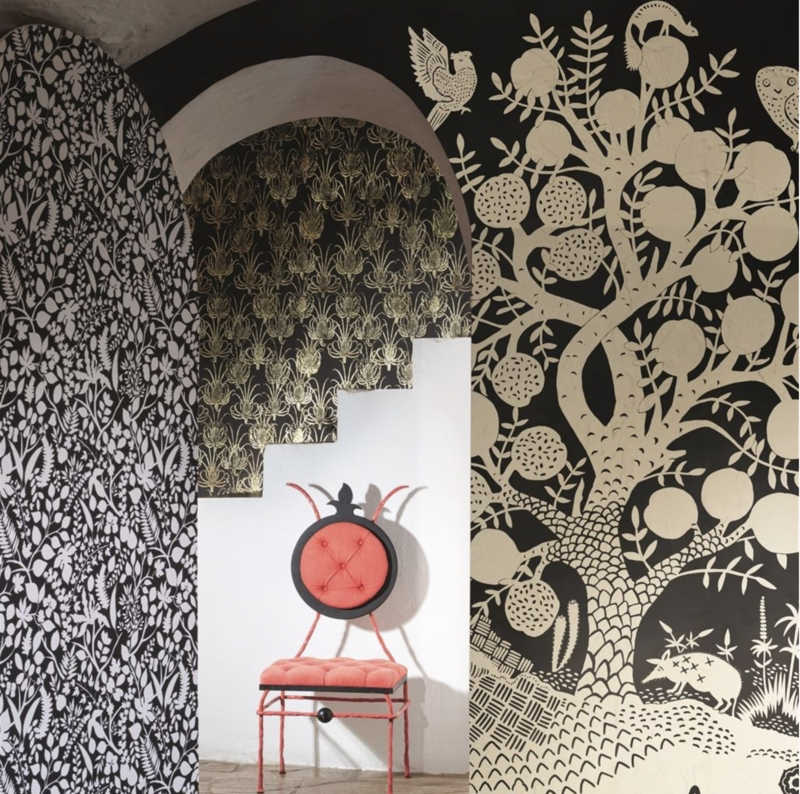 A striking design from Maison Christian Lacroix certain to capture an audience. Described as “an illustrative and bountiful vision of the natural world with exotic creatures and forest trees in silhouette form” and available in three high contrast colour options. What this design lacks in show-stopping colour, it makes up for in calm, dreamy and realistic detail inspired by impressive, painted ceilings of wealthy 18th-century homes. A design which is easily carried across all walls and ceiling to create a calming and thought-provoking space. There’s no need to trek to far-off tropical climates now that you can bring them straight into your own home/ hotel/ restaurant. 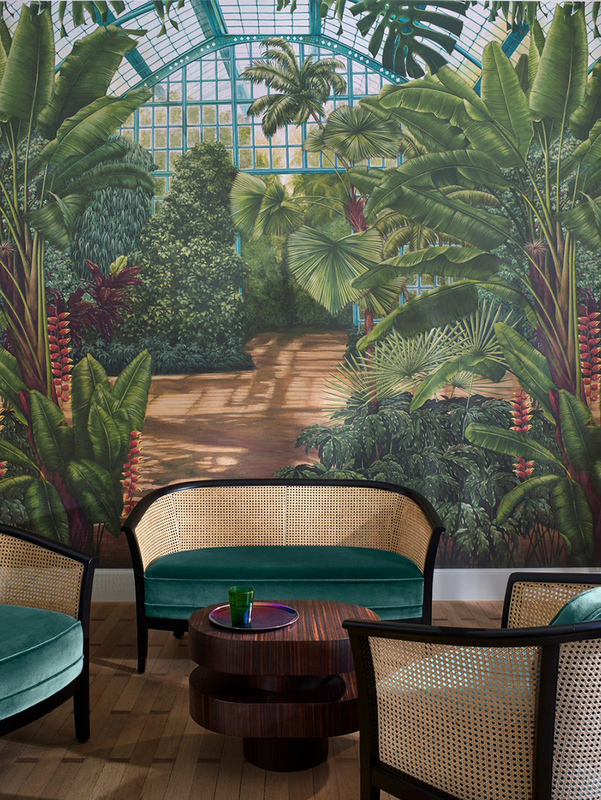 This hand-painted mural by Cedric Peltier features tropical plants, banana trees and birds of paradise. These realistic scenes on murals are having a bit of a moment, supported by recent developments in production and innovation – also made popular by an increased focus on backdrops to create Instagrammable photographic settings. 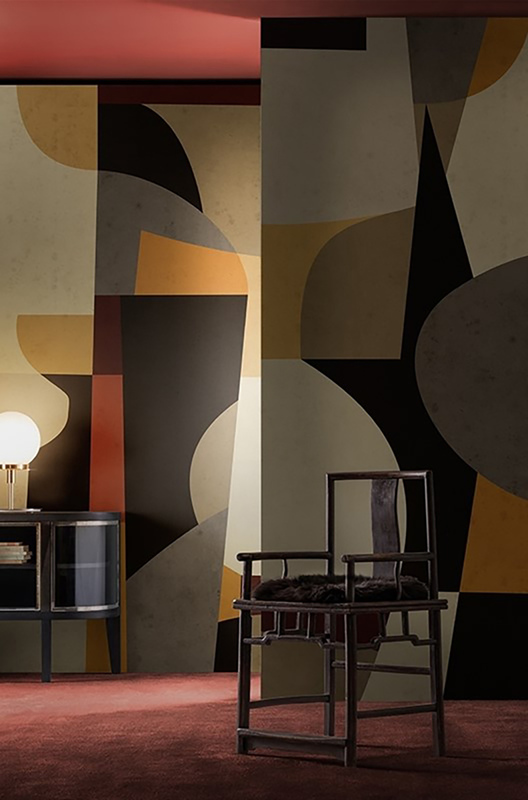 This dramatic design from UK based company Graham and Brown has been created by taking an archive pattern and increasing the scale in order to achieve a mural which is modern, impactful, and beautifully detailed. 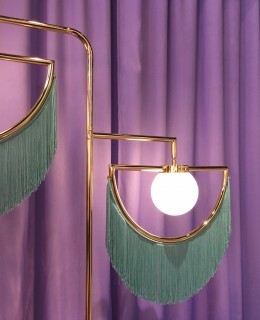 We spotted this design on the right-hand side at the Casamance stand at Heimtextil in January. 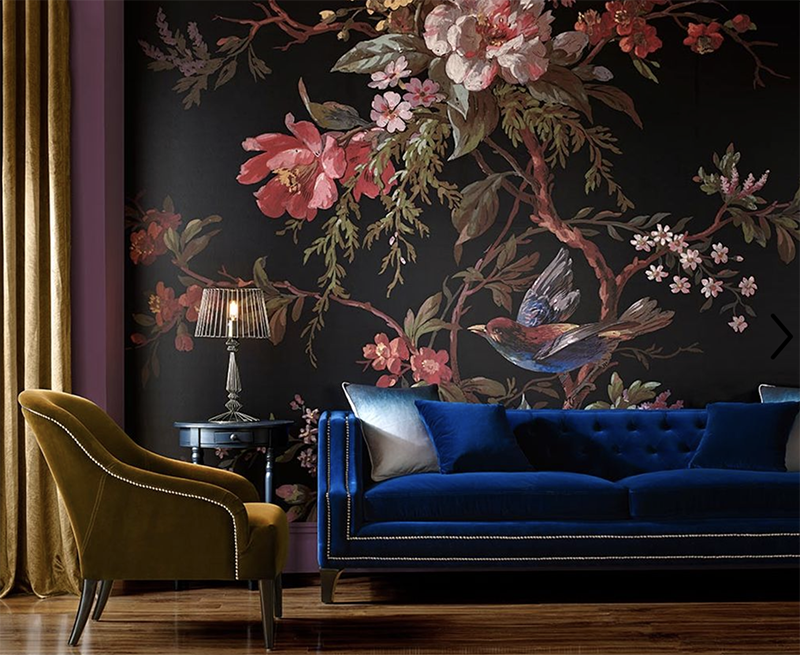 It perfectly demonstrates the developing trend for not only hand drawn and detailed florals but dark grounds and new and unusual colour combinations. This design feels appropriate for both smaller residential schemes as well as on a much larger scale too. Just like the design above from Casamance, this is another spotted at the same trade fair. 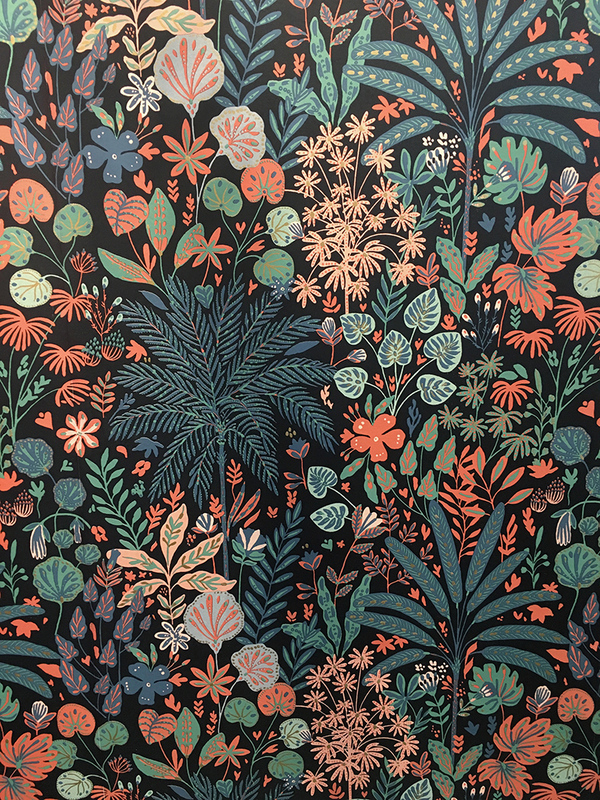 Featuring detailed, hand-drawn botanical elements which have almost a crafted, folkloric feel. The bright, on-trend colours against the dark ground really re-energise the trend for floral wallpaper. Lastly, a favourite of ours from Woodchip and Magnolia a Lancashire based studio. 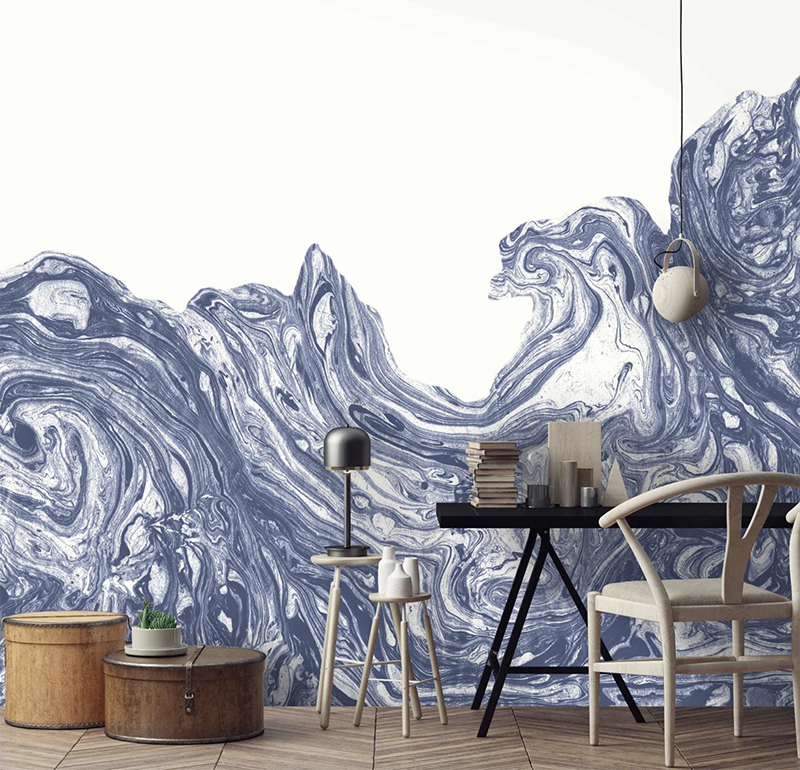 High Tide features a hand marbled pattern inspired by ‘the movement of the waves as they leave the shoreline’. As always we’d love to know your thoughts on the subjects we like to blog about. Please leave comments below.